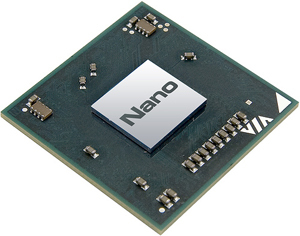 Previously we mentioned about VIA Nano processors Roadmap indicated that the dual-core series that were supposed to reach market place by mid of 2010, now it seems that the Fabless silicon manufacturer, VIA Technologies has pulled in its release plan with early sample availability to board makers by second half of 2009 and potentially mass production readiness by first quarter of 2010. The dual-core Nano processor is expected to compete against Intel Atom processor in both the nettop and netbook market segments. While VIA Nano seems to be a bit slow into market place but with its excellent performance and feature sets, it is claimed to be able to outperform Intel Atom based on initial performance benchmarking data. The major advantage of this new dual core processor as compared to Intel Atom is in terms of its out-of order execution capability that can process and execute utilizing available CPU cycles without stalling while waiting for unavailable operands. Besides, it is enhanced with 1333MHz FSB (Front Side Bus) speed which is two to three times faster than what being designed in Intel Atom with 533Mhz. What makes it more prevailing is it is featured with SSE4 (Streaming SIMD Extension 4), an enhanced instruction sets as compared to SSE3 being available in Intel Atom that is believed to be able to boost up graphics, multimedia and web applications processing power significantly. No pricing has been announced yet but some do believe that despite the great feature sets being integrated into the processor, the famous low cost silicon manufacturer will plan to keep its pricing competitively in order to gain some market share in these price sensitive market segments.